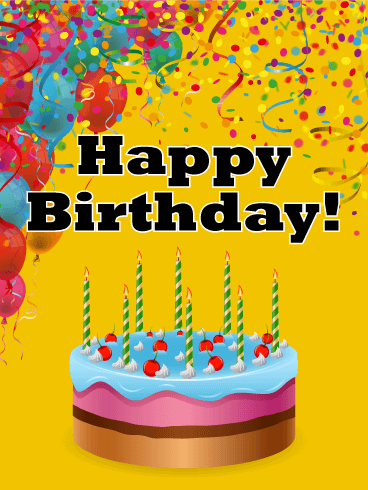 Want to wish someone a Happy Birthday? 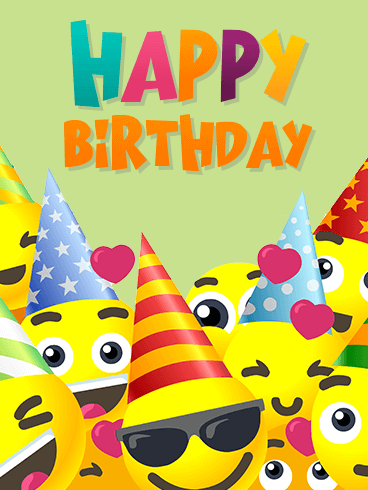 Every Smiley face is more excited than usual, because today is your birthday! 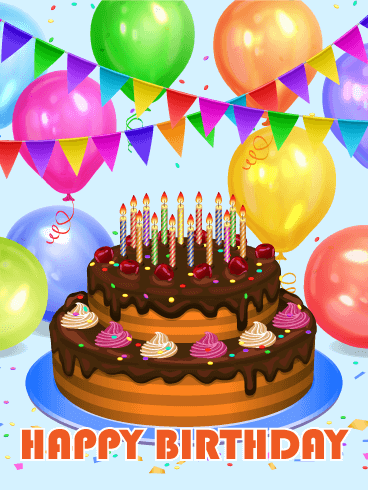 Do your spangled party hats and shout out loud and bright, HAPPY BIRTHDAY! Anyone and everyone will feel special when presented with these glad tidings and joyous wishes. With this Smiley Face Happy Birthday Card at hand, one can never be caught off guard by an unexpected birthday. 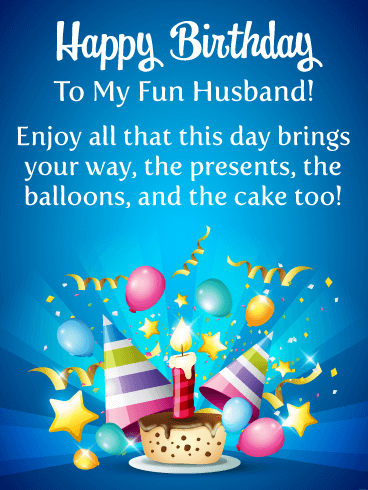 Send a fun and cheerful birthday card to your husband this year! 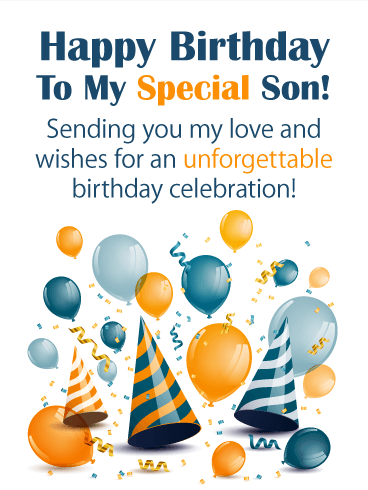 He will absolutely love the vibrant colors and the awesome celebration icons, especially the birthday cake with its brightly lit candle! 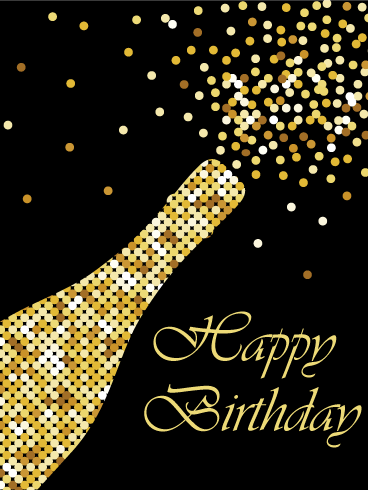 The golden confetti and stars, along with the festive balloons make this birthday card a must-have! Send this outstanding greeting card over to your husband today, he will be so thankful you did. No better time to propose a toast than your husband's birthday! So grab a glass and let him know how much he means to you! 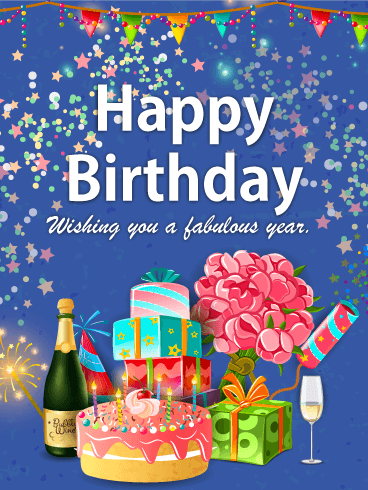 This exceptional birthday card was designed with a vibrantly colored background, two fun champagne glasses, and of course, some birthday streamers and confetti! 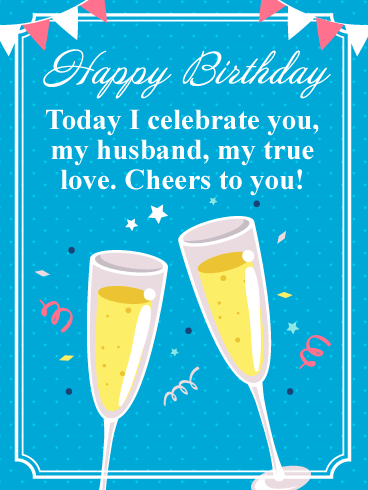 Get the party started by sending this festive birthday card over to your loving husband today! 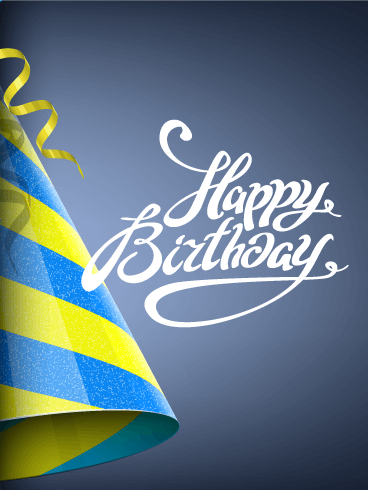 Get your father excited about the festivities to come with this awesome party hat birthday card! 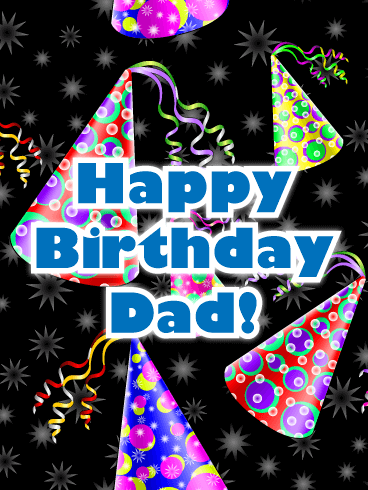 It's filled with colors that look great against the dark background and the lettering that spells out Happy Birthday Dad are front and center, so your father can't miss it. 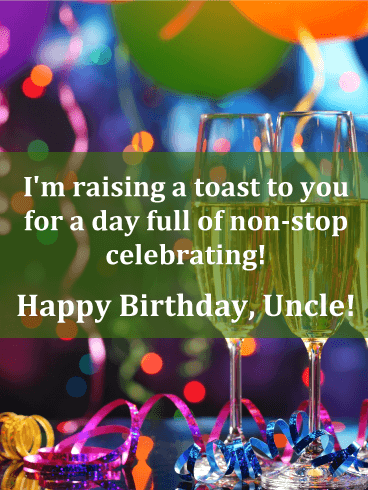 These birthday hats will get your father's celebration started the right way and he will certainly appreciate that you were thinking of him. 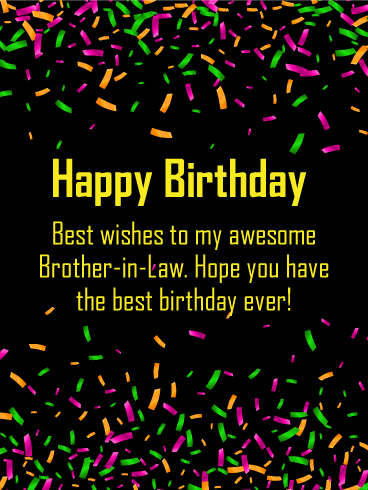 Send this marvelous birthday card over to your dad today! Know someone who is a total party animal? 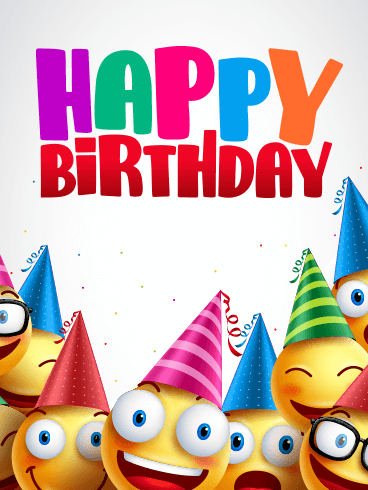 Get the party started by sending them this happy birthday card showing a crowd of different emojis wearing polka dotted, striped, and starred party hats. This birthday card is a great fit for that outgoing person in your life who loves emojis, crowds, and making memories with friends. 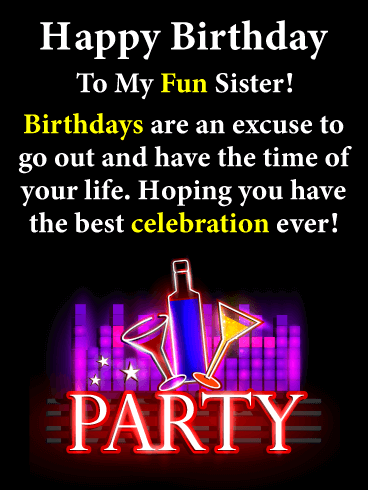 They're the life of the party and this card will show them how much you support them today and every day! OMG it's a birthday! Say it with a smile! Send it with a wink! We've got the perfect birthday card for the emoji lover in your life. 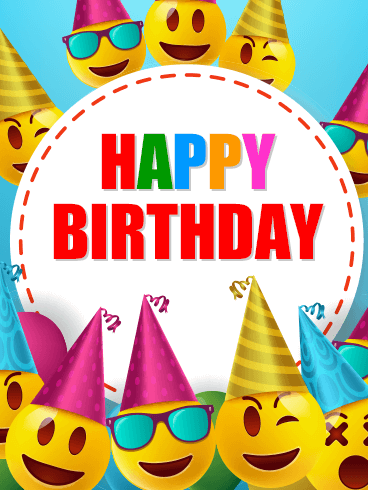 Step up the standard Happy Birthday wish by sending this fun card that features the most popular emoticon faces; smiley, winking smiley, sunglasses smiley and even a surprised face hiding in the bottom right corner! 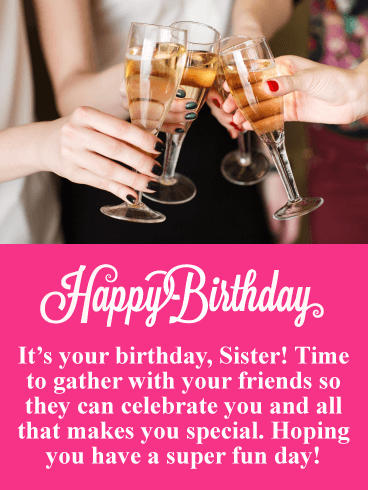 Birthdays are perfect for celebrating with friends and this birthday card highlights that! 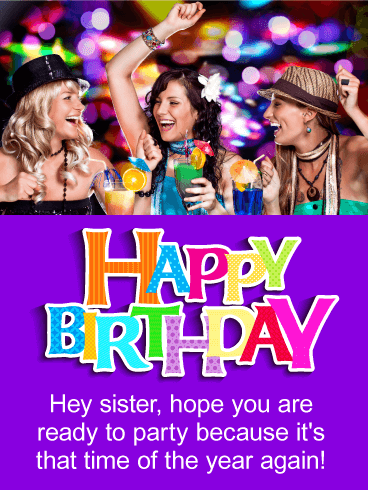 It displays a fun image of a girl's night out and making a toast in honor of your sister's birthday! This will certainly get her ready for her big celebration! 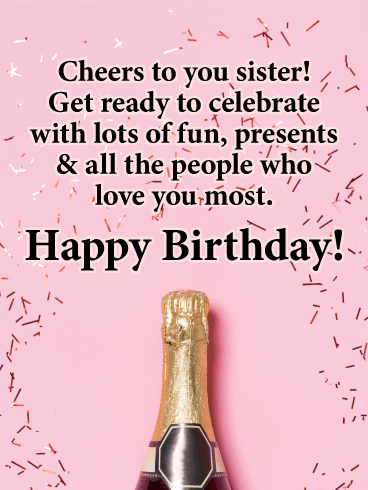 Let your sister know you are thinking of her by sending these drinks to get the celebration started! 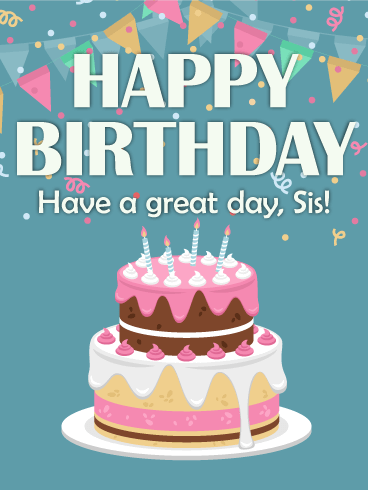 She will be very happy you sent such a fun birthday card her way! 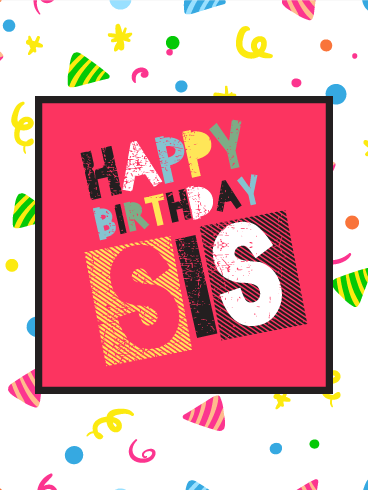 Get the party started with this sensational neon birthday card that your sister will think is the best! It has excitement written all over it! It features neon party drinks that will have your fun sister looking forward to the festivities of the day. So remind your sister that birthdays are an excuse to have the time of her life by sending these awesome drinks to her today! 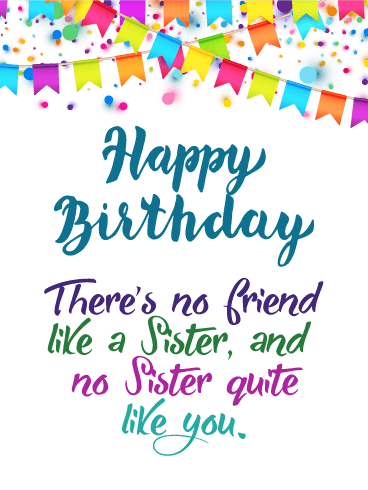 She is going to love this birthday card! Pop the champagne and release the confetti! It's time to celebrate a special birthday! 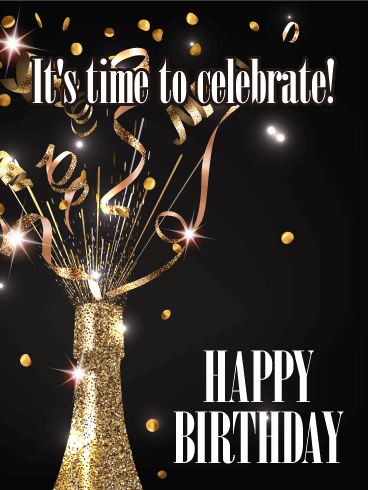 The gold, black, and white color scheme of this birthday card adds a layer of elegance, while, of course, confetti adds a touch of fun and excitement. 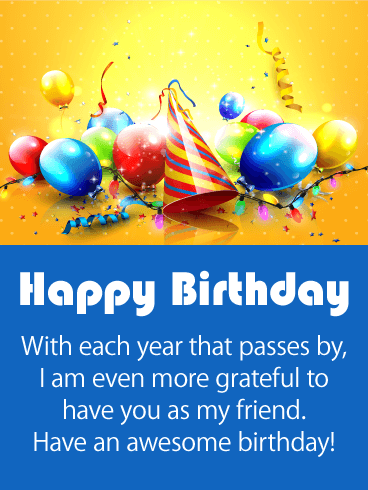 This is a great birthday card for anyone in your life, from a parent, to a co-worker, to a good friend. There is a party taking place and the excitement is building. It's the perfect way to make sure he knows you want to celebrate his birthday. 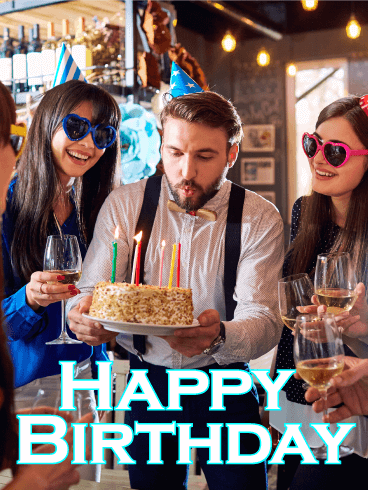 A man celebrating his birthday with his friends is the theme of this birthday card. He and his friends wear party hats in a scene that looks like great fun. 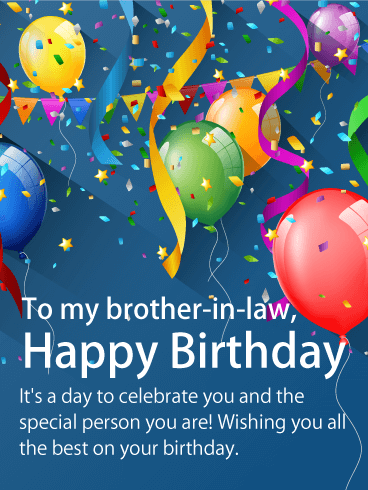 When he receives this birthday card in his email inbox, he will know you care. 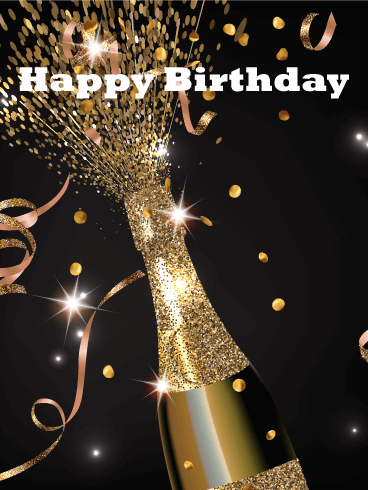 Glasses clinking and fireworks sparkling - help him celebrate his birthday the right way with this festive birthday card! When it comes to being a great guy, he sure is one. 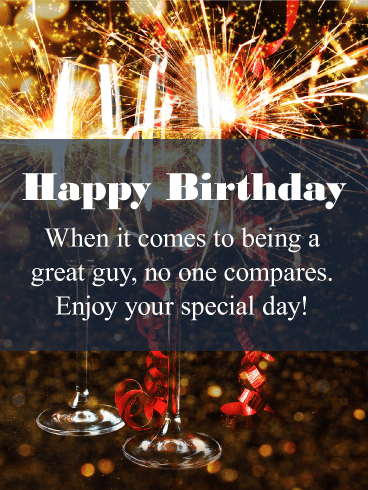 Let him know you think he's someone special with this festive birthday card on his special day. 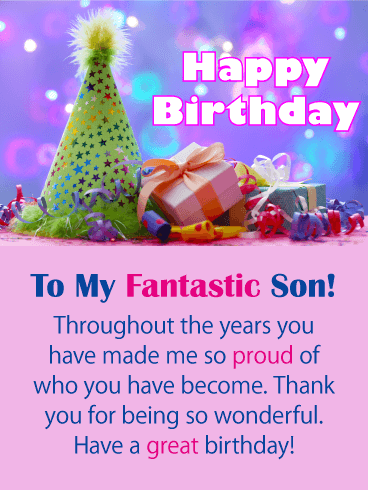 This birthday card is sure to make him grin from ear to ear when he receives it. There's so much going on with this birthday card, which makes it super exciting and tons of fun! The red, white, and blue color scheme adds a subtle patriotic element, while the fun font in which the words are written takes it to another level. 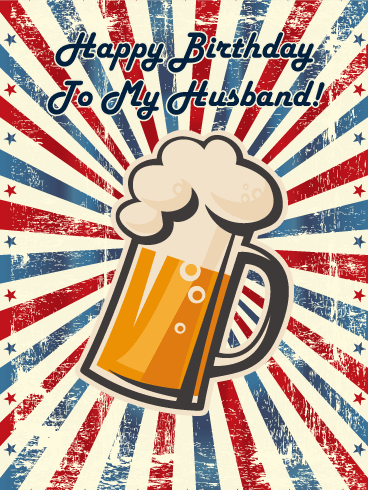 Throw in a pint glass of beer, and you have a birthday celebration that your husband is sure to love! The Champagne glasses are full, the decorations are out, everything is in place for a birthday celebration your uncle will never forget! 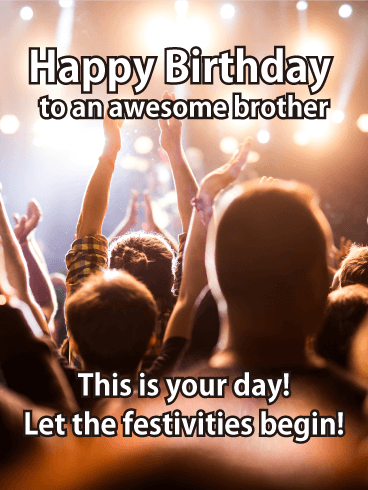 Send this fun & festive card to make his day feel like one non-stop party! 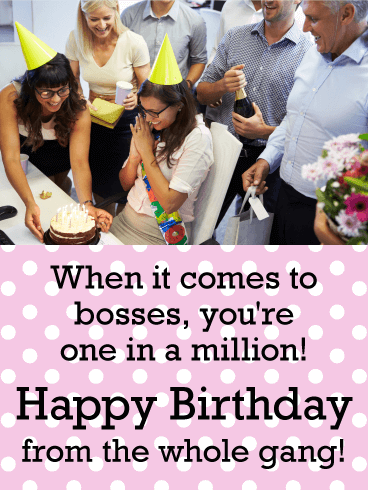 It's your boss's birthday. 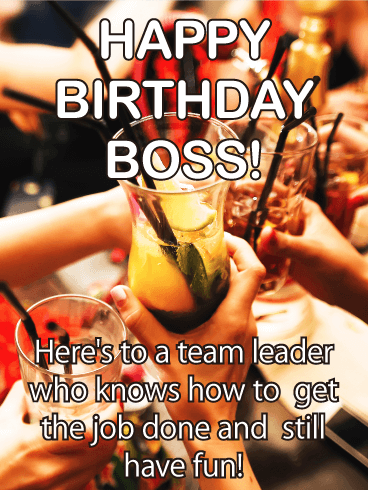 Time to get out the party hats, cake & gifts and celebrate this one-in-a-million team leader in the biggest and best way possible! This colorful card is a great reminder of how special they are to everyone and how much it means to be able to surprise them for all their hard work and dedication every day. When it comes to work, your boss is all business. But on their birthday, it's time to celebrate and have a little fun! These festive co-workers are here presenting a cake and presents to their leader, who looks ready for a party herself. What a great way to let your boss know how much you appreciate everything they do for the entire team. 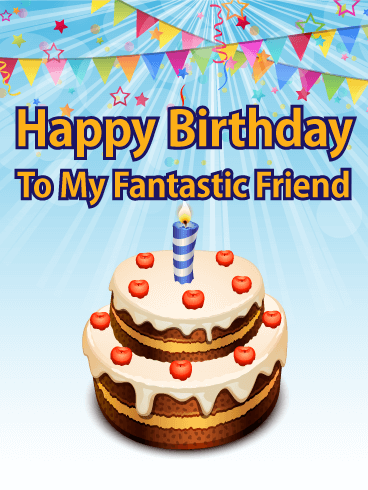 Let your friend know how grateful you are for their friendship by sending this festive birthday card out to them on their birthday! It comes complete with balloons, ribbons, party lights, and a decorative birthday hat, what else says happy birthday more than this! 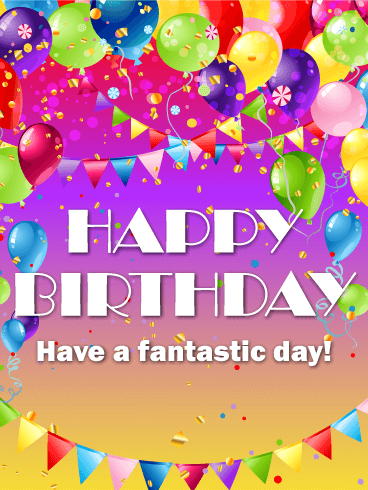 So send your friend this wonderful Happy Birthday card to get his or her day off to a great start! Celebrating a birthday with a good beer is always a good thing and what makes this birthday card ideal for sending to your friend. 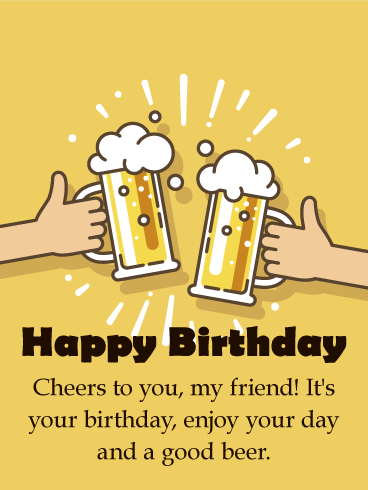 This Happy Birthday card will allow you to say cheers to your buddy and let him or her know it's time to enjoy their day with a good beer. 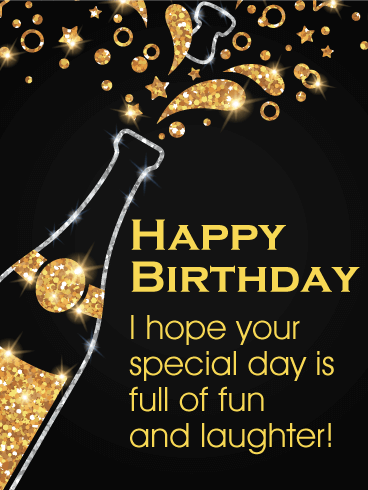 Don't delay, send this birthday beer card out while it is still cold! 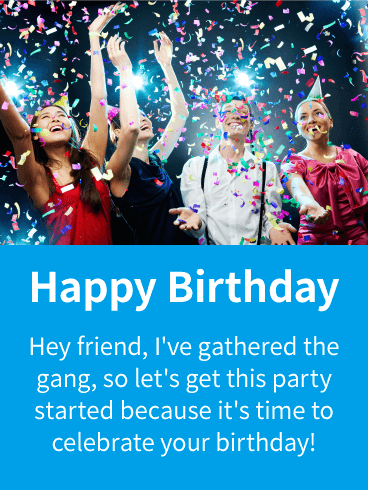 It's that time of the year again, time to celebrate your friend's birthday! 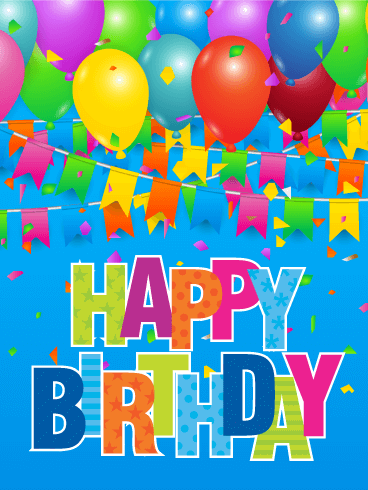 No better way to let them know it's time to start the party than to send this festive Happy Birthday card. It's filled with cake, drinks, balloons, confetti, and a group of friends that are ready to start the celebration. 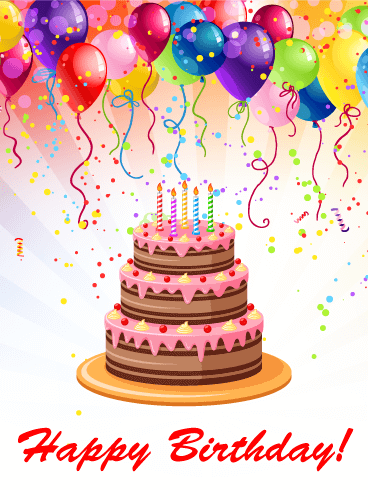 Don't keep them or your friend waiting any longer, send this Happy Birthday card out soon! There's a colorful celebration in full swing and the excitement is building. It's someone special's birthday. Make sure they know you're ready to celebrate their big day with this fun birthday card that comes complete with its own balloons, streamers, and birthday cake. 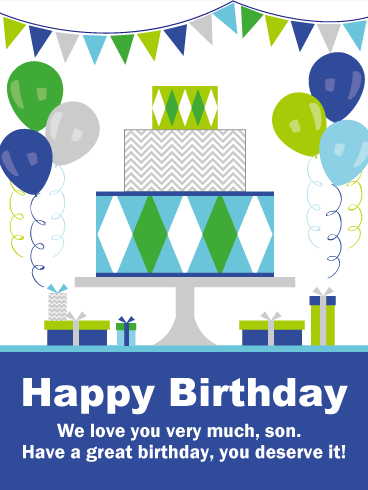 Your friend or family member will be delighted to receive this celebration in their email inbox because it shows them just how much you care.